Very short blog. Speedtest.net or dslreports.com are commonly used for checking Internet speed. Here is https://fast.com as a quick and ad-free alternative. Try it out. I find it to be the best Internet speed test out there. It is created by Netflix. They wanted users to have a quick way to check bandwidth with no bloatware around it. It also performs what is called as a “Loaded latency” test – a modified Ping test. Click Settings to adjust how long it tests the speed. This is useful if you expect fluctuation in the speed over time. Windows has a mind boggling number of settings and options. Ultimate Windows Tweaker makes it very easy to customize windows settings. Have a look and start using it. I created this Paste as Pivot utility (macro) along with Raj Chaudhuri. It helps you in copying cells from Pivot Table and pasting them as GetPivotData functions. You must read this article about GetPivotData in order to understand the background information. This is a utility I created along with Raj Chaudhuri many years back.Use the scribble tool to draw a waveform or shape, the utility will create the data for it. You can then create a line chart which looks similar to original drawing. I wrote many articles recently about using ZOOM while presenting. I originally thought I will write only one article, but ended up writing 6. This Zoom KNOWLEDGE PACK will guide you to the right article, depending upon what you need. This is the last article in our Zoom series. Surface Pro offers a very nice option for working with the Windows zoom feature. Let us learn it quickly. It is literally a handy feature! Estimated reading time 3 min. I wrote three articles about zooming in while showing technical / software demos. 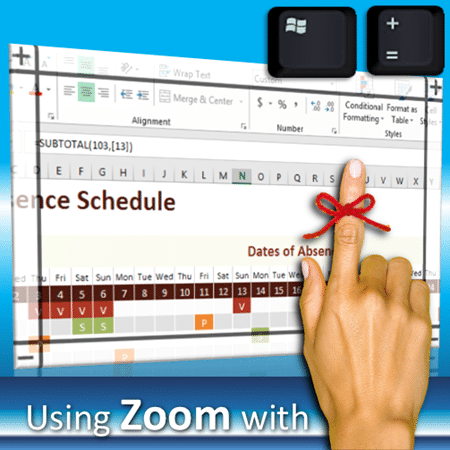 I covered the Windows Magnifier (core features and detailed features) and ZoomIt tool. ZoomIt is a powerful zoom tool which works in all versions of Windows. It provides features like annotation, timer, and more…Read the previous two articles before you read this. Read the previous article about Zoom before reading this article. Here we explore more useful features of the Windows Zoom tool. If you are a trainer and you need teach any type of software, you need to know how to use zoom. Without Zoom, your demos and training is only partially effective. Read on and find out how to use ZOOM to amplify the impact of your training and demos.